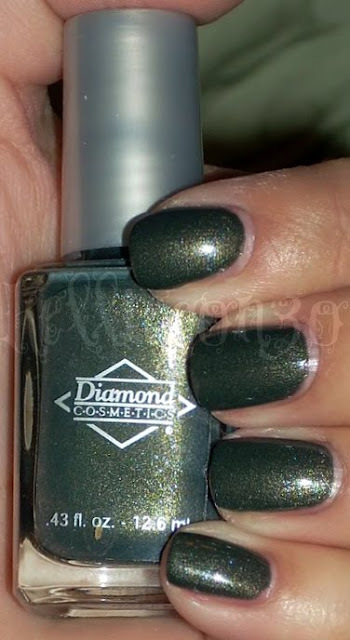 i had been wanting more diamond cosmetics polishes since i got a taste of them with the polish bloggers exchange gift i received, i got some of their mattes. so i ordered never so evergreen, chainmail charm, and seafoam green. never so evergreen is a pretty unique shade, or at least it was until sephora by opi came out with absinthe makes the heart this past winter. oh well! 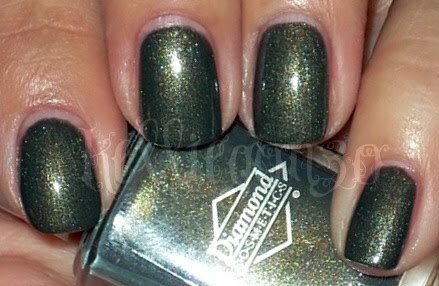 a darkish mossy swampy color that really does look like it could be found in an evergreen forest :) i do like this polish, but it didn't really grab me like i thought that it would. 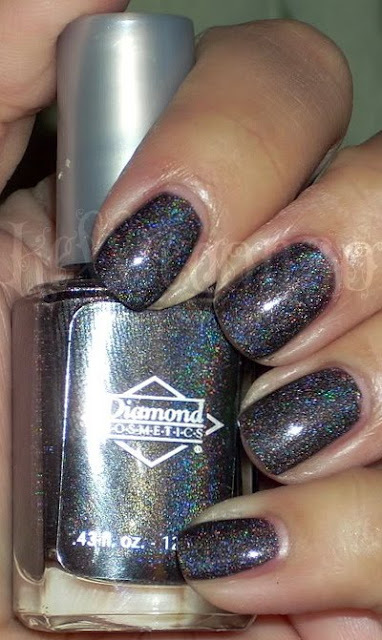 diamond cosmetic's formula is very nice, with these swatches i didn't have to do any clean up! this is 3 coats. chainmail charm is a DC favorite of many a polish fiend and of course i loved it! it is a charcoal holographic polish, along the same lines as color club's revolution, opi's my private jet, or china glaze's let's do it in 3D (albeit this one is way lighter). so...yeah, it's been done. but that doesn't stop me from owning, oh say...all of them? haha and believe it or not they are all different! not tremendously so, but still :) i loved the different flashes this one has even in low light. 3 coats. seafoam spray is one i was iffy on but i ended up really liking it. it's a light almost minty green pearl that i was afraid would produce bad brushstrokes, but this one didn't do too bad at all. there is also a nice golden sheen on it which was unexpected. this is 4 coats as it does take a bit to build. oh and please PLEASE excuse the horrid dryness around my fingers, it was from the acetone as i was swatching, but of course i was too busy busy to pay attention and notice that before it took a picture huh.